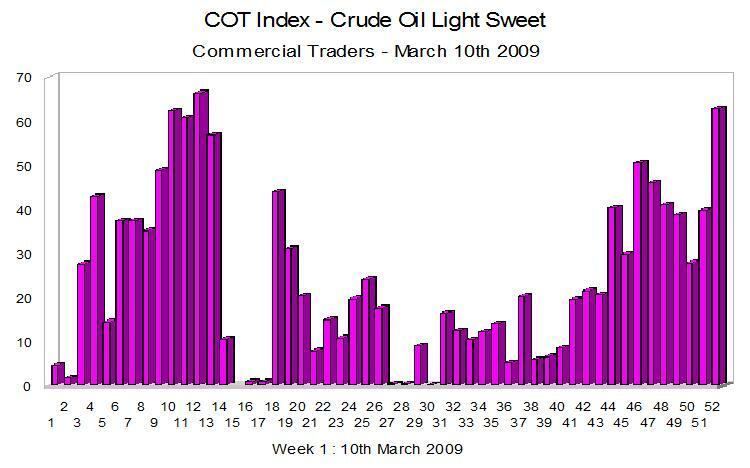 The weekly chart for crude oil futures, shows little change in the COT index data, with a very low reading once again, suggesting that we are reaching a turning point for the daily oil price, and it would not be a surprise to see oil prices rising in the near future. The trend of the last three months has been for oil prices to move sideways in a relatively narrow trading range between $35 and $50 per barrel. The longer this trend continues them the more dynamic will be the breakout from this range when it occurs. With OPEC having decided not to cut oil production this week, this could add a bullish sentiment to the market this week, and it would not be a surprise to see a break above %50 per barrel as a result. Whilst the COT index is not a timing tool, it can provide us with a direction, and from the data we have seen in the last few weeks, with the commercial contract holders not selling into the market, we should therefore expect a move higher in due course. You can find the latest daily oil price on the live charts, along with the spot silver price and spot gold prices. In addition an economic calendar is now also available which is updated each day with the main fundamental news.